﻿ Ohio wins top RPAC honor from NAR! Ohio wins top RPAC honor from NAR! 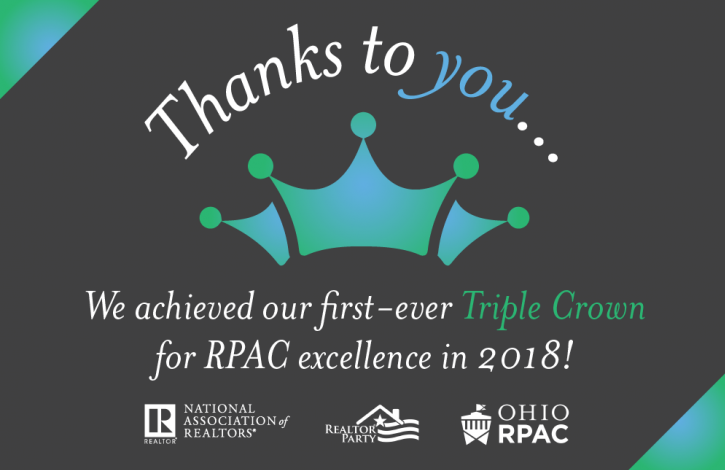 Ohio REALTORS earned its first-ever Triple Crown for RPAC excellence in 2018! And, reaching a 37 percent RPAC participation level! "Thank ALL of you for your hard work and dedication to our industry and the REALTOR Party in 2018," said Leigh Brown, NAR 2018 RPAC Fundraising Trustees Chair. "It is because of your spirit and leadership that we had such great successes this past year. We are amazed at how many states stepped up to the plate and smashed their goals out of the park." In addition to Ohio being honored, 11 of our Local Boards/Associations achieved NAR Triple Crown excellence last year: Ashland Board, Cincinnati Area Board, Dayton REALTORS, East Central Association, Firelands Association, Heartland Board, Licking County Board, Medina County Board, Springfield Board, Warren Area Board, and Wayne-Holmes Association. "Earning our first-ever Triple Crown status is a remarkable achievement for the entire Ohio REALTOR community," said Ohio REALTORS Chief Executive Officer Scott Williams. "Ohio was instrumental in the formation of RPAC 50 years ago and our recent accomplishment reinforces our stature as an industry leader. "Thank you to the thousands of Ohio REALTORS who graciously shared their treasure to strengthen the industry's voice in support of private property rights!"